Découvrez deux des trésors culturels les plus célèbres de Milan, le Duomo et La Scala, accompagné d'un guide expérimenté. Votre forfait comprend l'accès coupe-file aux deux sites, afin que vous puissiez passer plus de temps à profiter de ces monuments sans vous soucier des longues files d'attente. Visitez le célèbre opéra de La Scala, qui abrite également son propre musée. Puis, traversez la Galleria Vittorio Emanuele II, un célèbre et magnifique passage commerçant avec de hauts plafonds de verre et un intérieur richement décoré. Faites ensuite un arrêt dans le splendide Duomo, le clou de Milan. We absolutely loved our tour with Alessandra. She was very knowledgable, passionate, and professional. She also has a great sense of humor! We were never bored and would love to take a tour from her again. I learned a lot about the Duomo and la Scala that I never would have known! The tour of La Scala was very interesting. Tour guide very knowledgeable about the history of the theatre but not as much about how the theatre works--stage scenery changes, etc. Spent too much time on the paintings in the museum which left almost no time to see the costumes. So we did not repeat the Duomo tour. Unfortunately, in order to see La Scala, our only online choice was to book the Duomo tour as part of the package...a waste of money and no response from Viator when asked to refund that portion. 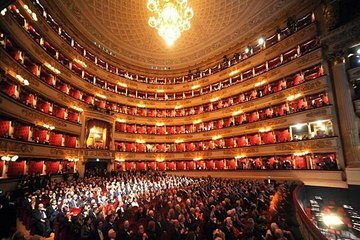 Great opportunity to see inside La Scala. Very informed commentary - obviously knew what she was talking about. Good to be with a guide as the theatre staff very officious. Easy entry to the Duomo although tour there was a little short. Would have been nice to be offered the opportunity to visit the roof as some in the group seemed to know about.